When I was a kid, I hardly ate plain chocolate or vanilla ice cream. Standing in front of the myriad of choices at the ice cream shop, the plain, boring flavours disappeared and all I saw were pieces of peanuts, swirls of caramel, and chunks of chocolate. You see, I loved texture in my food. I wanted to munch and crunch on my ice cream, not just lick it quietly. If I was in the chocolate mood, I wanted chunks and chips and swirls, not just one or the other. The more the merrier! Since I love texture and crunchy things in my food, you’d think I’d already have an oatmeal cookie recipe on my blog. But I didn’t…until now that is! You see, up until now, I was always wary of oatmeal cookies, since 95% of the time they hid raisins within their textured depths and tricked me into thinking they were chocolate chips. I can’t recount how many times I gagged on the offending raisin, feeling betrayed by cookie makers everywhere (I really hate raisins). But then a few weeks ago, I had a chewy oatmeal cookie that was studded with creamy chocolate chips, and NOT raisins, amid a chewy, crunchy oatmeal texture and my life was changed! Chock-full of chewy oatmeal goodness, these soft, textured chewy oatmeal chocolate chip cookies will convert even the most die-hard only-chocolate-chip-cookie fans into oatmeal-chocolate-chip-cookie fans. Check it out! In a large bowl, cream your butter and sugars until smooth and creamy. Add egg and vanilla. Next, add the baking soda, cinnamon, oats, and flour all at once. Mix well, but only until all ingredients are well incorporated, but now more. Add chocolate chips and M&Ms (if using). Chill dough in the fridge for at least an hour. Preheat oven to 325 degrees F and scoops out chilled dough onto parchment-lined baking sheet. Press down slightly with the back of a spoon. Bake for 9 to 11 minutes, or until the edges of the cookies are slightly browned. Remove from oven and press down with a back of a spoon slightly, while they're still warm. Let cool before enjoying. Store in an airtight container. Recipe inspired by Sally at Sally's Baking Addiction. I’m a big fan of the good ol’ classic chocolate chip cookie, but you can’t deny the powers of the classic oatmeal cookie! 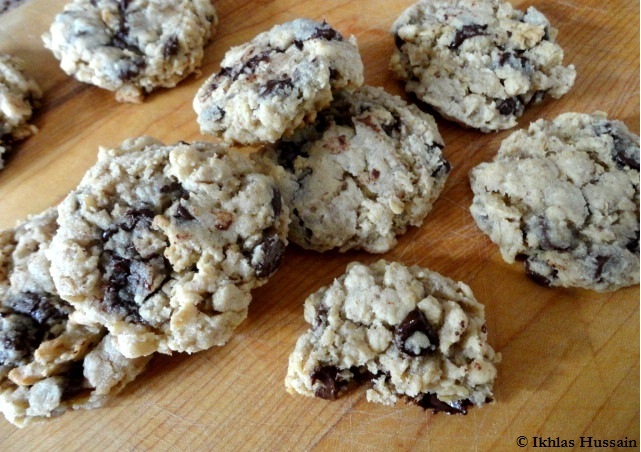 Full of a chewy, crunchy texture, these cookies are certainly not boring! So go on, bake up a batch of these chewy cookies, kick back and relax! This entry was posted in Cookies, Recipes and tagged chocolate, cookies, recipes, sweet. They look completely PERFECT! 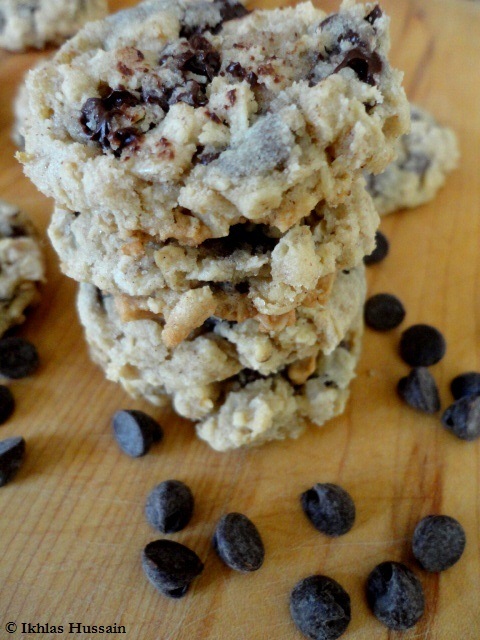 My chewy oatmeal M&M cookies will always be a huge favorite of mine. 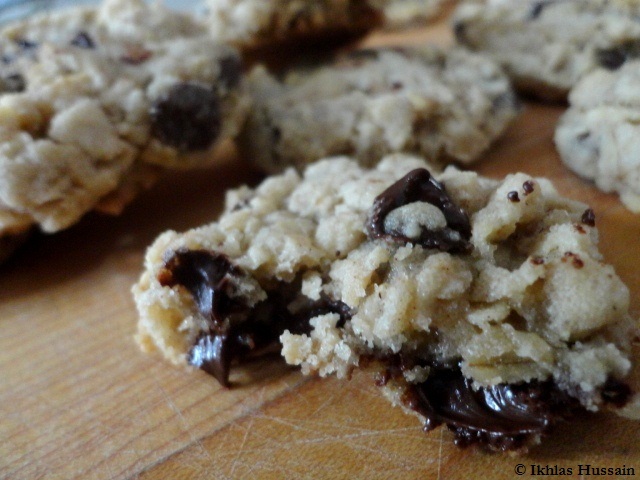 Oatmeal + chocolate chips + chewy cookies = how can you go wrong?? 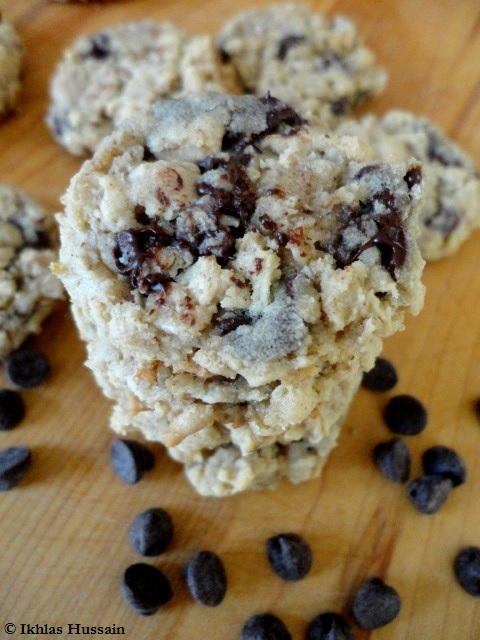 I love raisins, but a good oatmeal chocolate chip recipe is always a winner. 🙂 LOVE these! Can I quick oats or is that the other type? Hi! So it’s old-fashioned oats that are used in this recipe, not quick oats. They’re the oats that are chunkier, rather than the ones that have been chopped up. Hope that helps! I made these tonight – smell delicious but came out flat. Also, this recipe didn’t indicate the size of the ‘scoop’ so that might’ve been my problem. Still yummy however! Hey! Sorry about that…it’s an older recipe so I may have had gaps in the recipe. Glad you still liked it! I have a question about the ingredients. Does the brown sugar have to be firmly packed or lightly packed? I just want to be sure before I start baking. And how many cookies does this recipe usually make? Hi there! The brown sugar can be firmly packed, and the recipe makes about 2 and 1/2 dozen cookies. Hope that helps!